The 1970s was an important decade for the development of Japanese pop-cultural icons. Kindergarten children back then would likely have been introduced to the characters Doraemon (1969), Anpanman (1973) and Hello Kitty (1974). A few years into elementary school, they probably would have enjoyed “Kamen Rider” (1971), and finally — just upon entering middle school — their imaginations would have been sparked by a slightly more ominous world of science fiction, characterized by giant robots and slick weaponry. Of the giant robot genre, “Mobile Suit Gundam” (1979) remains the most vivid in public memory. The animated series, spinoffs of which are still being produced today, revolves around massive human-controlled machines, called “mobile suits” or “mecha” in Japanese, which fight one another in space. Central to creating the series’ aesthetic is “mechanical designer” Kunio Okawara, whose work is currently on display at the Hyogo Prefectural Museum of Art. The exhibition, “Legend of Mechanical Design” follows Okawara’s 40-year career in this field of design, showcasing hundreds of original design sheets, promotional posters, toys and sculptures. The first artist to be credited as a mechanical designer, Okawara’s work focuses on illustrating the exteriors and interiors of robots, space ships and gadgets. In his model sheets, he attempts to accurately imagine the circuitry and parts involved in making the machines as realistic as possible. Okawara’s designs serve as blueprints. Each line is deliberately pronounced, and the physical dimensions of each machine are clearly specified. These conceptual drawings would then serve as guides for animators to depict the appropriate physical movements of each piece of machinery. Through the ’70s, Okawara continued to work with Tatsunoko Productions, inventing mechanics for various shows, including “Tekkaman” and “Hurricane Polymar.” But it was his later work for Sunrise Studio’s “Mobile Suit Gundam” that propelled his work to its ubiquitous status in Japan. The original “Mobile Suit Gundam” series aired from April 1979 to January 1980 on the Nagoya Broadcasting Network. With its success, several full-length films, comics, and additional television series followed. 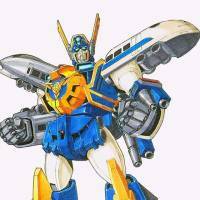 In the early 1980s, toy maker Bandai obtained the licensing rights to the Gundam universe and began manufacturing plastic model kits, toys and dozens of video games. It even produced an 8-bit computer named after the most popular robot of the series, the RX-78. In total, Gundam’s estimated worth as a franchise weighs in at approximately $500 million. As a cultural figure, Gundam has been featured in Japanese fire-fighting campaigns, been used as a code-name by the Japanese Defense Forces, and since 2009, has been seen traveling the country as a full-scale model of the RX-78. Arguably most relevant to Okawara’s career as a mechanical designer, however, are Mitsubishi and Nissan’s cars — the Lancer and the GT-R respectively — whose designs were influenced by Okawara’s original Gundam blueprints. For the Hyogo exhibition, Toyota has contributed its promotional concept car also based on Okawara’s aesthetic (on limited display until May 4). Recently, the Hyogo Prefectural Museum of Art has been blurring the line between institutionally praised high art and contemporary design. Its last show on Finnish design focused on children’s book author Tove Jansson and her drawings of the Moomin characters. Using pop-culture icons, such as the Moomins and Gundam, brings into discussion the degree to which illustrations can be considered as “art.” Displayed in spacious rooms just across the hall from 19th-century Western sculptures and respected Japanese paintings, Okawara’s commercially successful designs are pitted against highly appraised centuries-old pieces, and viewers are asked to consider the arbitrary value placed on both high art and pop culture. This celebration of design in an art museum also brings up a compelling narrative on the very nature of the two forms. Whereas design is intended for commercial consumption, art is intended for meaningful personal exploration. But it is not that simple. Good art is collected and sold for millions of dollars to be appreciated by a privileged few. Good design is distributed to millions of people; it is plastered on billboards, shoved between the commercial breaks of TV shows, and aligned in the margins of newspapers. Good art is displayed in designated spaces where it is gazed upon in passing moments. Good design is seen everyday on morning commutes and city strolls. Of the two, one has a greater potential to create lasting images and feelings that embed themselves into our public memory. So much so that decades later, institutions that traditionally revel in privilege and wealth will discover them and reconfigure them into art. “Kunio Okawara Exhibition: Legend of Mechanical Design” at the Hyogo Prefectural Museum of Art runs till May 19; open 10 a.m.-6 p.m. (Fri, Sat. till 8 p.m.). ¥1,300. On May 5, Okawara will be signing autographs and presenting a lecture alongside Gundam’s director of animation Takahashi Ryosuke, and on May 6 and 7 children’s worships will be available.